We offer free microchips to implanters and professionals involved in our Implanters Incentives Program. As well as offering the world’s lowest cost microchip scanner, we also offer the lowest cost microchips for implanters and professionals. Our implanter incentives program (explained below) is the smartest and most cost-effective way to microchip animals, giving you free microchips for every PetScanner registration. If you'd like to get involved, please download our free app and contact us at implanters@petscanner.com - we'd love to hear from you! Click an option to see which steps of the Implanter Incentives Program apply to you. If you are implanting on behalf of someone else, steps 1 and 4 of the Implanter Incentives Program will apply to you. You can assist the breeder when pre-registering a pet if required. If you’re the implanter & breeder and transferring ownership, you will need to follow all steps. If you’re keeping a pet, you will need to follow step 1, then register the pet by our usual process found on the microchip registration page. You’ll still receive a rebate code for every 10 registered chips (step 4). If you are the breeder and transferring a pet to a new owner, you will need to follow steps 2 and 3 below. If you are the breeder and are keeping a pet, you can register the pet by our usual process found on the microchip registration page. Once you have bought a pack of our microchips (come in packs of 10) you will need to register each chip by either using our in-app barcode scanner or with a PetScanner microchip reader – these are logged in the ‘my microchips’ section under ‘active’ on the app. These active microchips can now be implanted into a pet. The ‘My Microchips’ section on the app shows your active and historical microchips. Active microchips are the chips that you (the implanter) have pre-registered and are not yet implanted into a pet. Historical microchips are chips that have been implanted and have transferred ownership to a keeper (therefore registration has been paid). When the active microchips are implanted into a pet, each one is logged by the breeder (either using our in-app barcode scanner or with a PetScanner) using the ‘pre-register pet’ breeder options. These microchips will be logged onto the breeder’s PetScanner profile on the app. The pre-registered pet microchips will be registered to a breeder with the ‘re-homing’ status. The re-homing status means that the pet is registered on the PetScanner database (for free) and is ready to be transferred to a new owner. 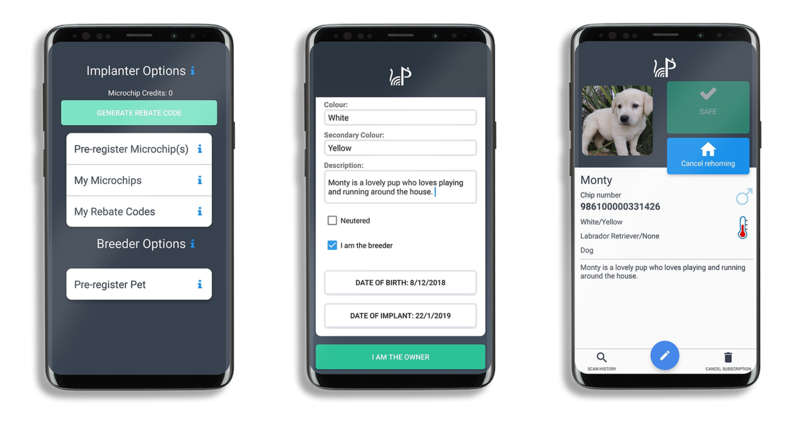 When a new owner comes to re-home the pet, they will need to simply download the PetScanner app and register their pet with PetScanner (by either entering the chip number using our in-app barcode scanner or with a PetScanner microchip reader). The registration cost of just £2.99 includes 3 free months of PetScanner Pet Protection and is fully DEFRA (government) compliant. 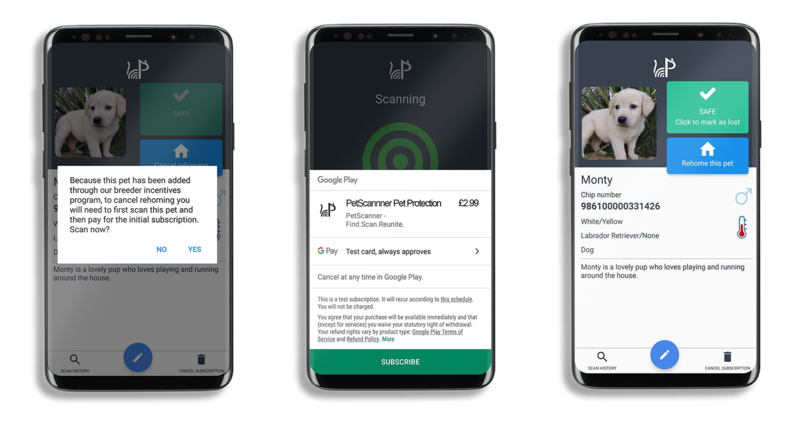 The new owner will receive all the PetScanner benefits including notifications when their pet’s chip is scanned or searched online and being able to change their contact details for free– providing the best chance of reuniting if their pet is ever lost or stolen. This pet’s chip will now move from ‘active’ to 'historical' on the implanters ‘my microchips’ section on the app. For each microchip that is registered with PetScanner (£2.99 registration has been paid), the implanter receives 1 microchip credit. 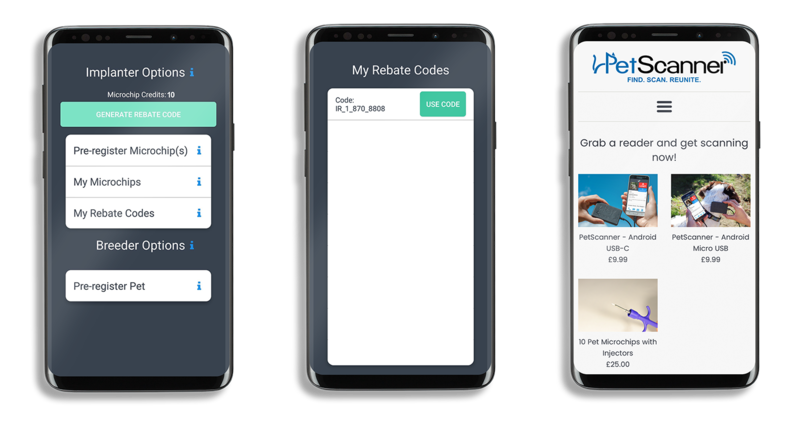 When 10 microchip credits are reached, a coupon is generated to receive 10 FREE MICROCHIPS – this coupon is shown in the ‘my rebate codes’ section on the app. When you click on the rebate code, it will take you to the PetScanner shop and AUTOMATICALLY generate the discount at the checkout. We only charge for delivery! 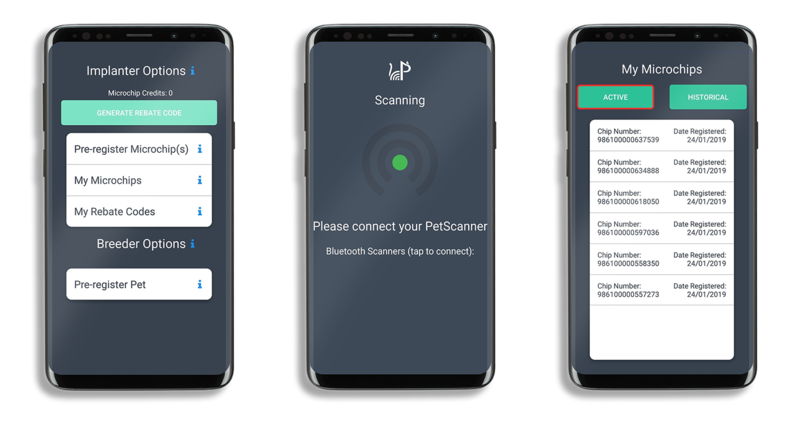 We offer the world's lowest cost microchip scanner at just £9.99 which can be used to register your pet on our database, identify any microchipped pet, help missing pets reunite with their owners or to check if your pet's microchip is working! We also provide the most advanced pet microchip protection. Find out more about our scanners and PetScanner Pet Protection!